When Britain entered the First World War on 4th August 1914, joining France and the Russian Empire – the Allies – against the Central Powers of Germany and Austria-Hungary, The Burlington Magazine had been published continuously, and successfully, for eleven years and it had already experienced an eventful history. Luxuriously produced with many photographic reproductions on costly paper and striving to maintain some independence from the art trade, the Burlington had serious economic problems and risked closure as early as September 1903. 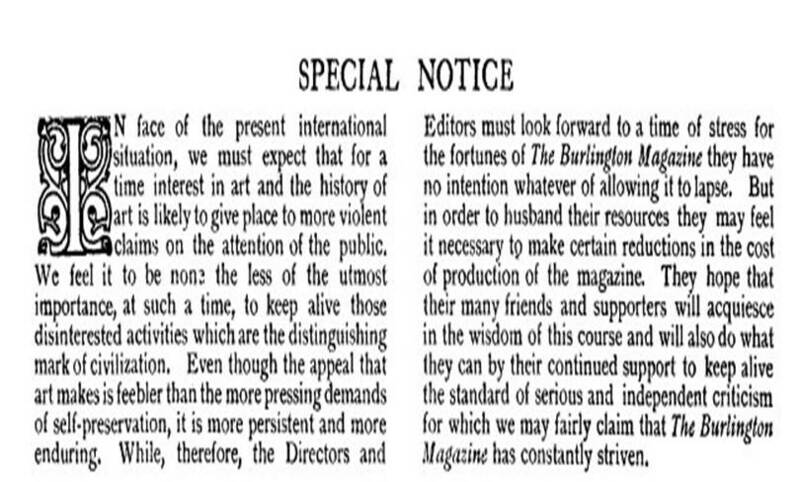 The Burlington underwent several editorial changes in its first eleven years of life, but the joint editorship of Roger Fry and Lionel Cust, begun in December 1909, gave the magazine some stability. The progressive artist-scholar Fry and the conservative museum professional Cust were then joined in January 1914 by More Adey, a knowledgeable art dealer and classicist, who was openly associated with figures of scandal at the time, such as Oscar Wilde and Robbie Ross. This somehow oddly matched triumvirate led the Magazine throughout the war until May 1919, when Adey and Cust left because of the disagreements caused by the editorial hegemony of Fry. The Burlington published over one hundred articles related to the war between 1914 and 1919 and its position was complex. First there were the ties with Germany. The Burlington, with its emphasis on historical research, was indebted to aesthetic models inspired by German standards. To these ideological affinities must be added the actual professional links between Germany and the Burlington. German and Austrian connoisseurs were part of the Burlington’s earlier consultative committees: Wilhelm von Bode and Adolf Furtwängler before 1910 and the pupils of Bode Georg Swarzenski and Josef Strzygowski right until September 1914. German writers such as August L. Mayer, Iaro Springer and Oskar Fischel contributed articles; German exhibitions, books and periodicals were routinely reviewed by its British writers; and articles contained numerous references to German advances in research. These connections made a simplistic taking of sides very difficult, especially when the conflict had only just commenced and its devastation had not yet begun to take its toll. Politically the Burlington was the product of a complex ideological milieu, with interactions between progressives and conservatives. It was supported by members of the aristocracy: the first names on its Consultative Committee were the formidably powerful Earl of Plymouth (Robert George Windsor-Clive), the Earl of Crawford and Balcarres (David Lindsey) and the Viscount (Harold) Dillon. A trio of conservative connoisseurs, Plymouth, Crawford and Dillon, took their duty of stewardship seriously and adopted an ethic of public service, serving on national museums boards for decades. Plymouth was a Trustee of the National Gallery for twenty-three years and Crawford for fourteen, whereas Dillon was Chairman of the Trustees of the National Portrait Gallery for thirty-four years, from 1894 to 1928. Crawford and Plymouth were publicly linked to the Conservative party and Crawford had a long successful career within it, being president of the Board of Agriculture in 1916 and Lord Keeper of the Privy Seal from 1916 and 1919. Yet the Burlington had progressive, even radical, origins. Its first editor Robert Dell, a former director of Connoisseur, was a Christian Socialist who made clear Marxist allusions to the ‘Tyrant bourgeoisie’ in the first Editorial of the Burlington. At the eve of the war Dell lived in Paris, working as arts correspondent for the Burlington and other periodicals, combining, like Félix Fénéon, the apparently conflicting roles of proclaimed anarchist and successful art dealer. After the war begun Dell left the art world altogether for political journalism. The same combination of connections with the conservative establishment and progressive politics were maintained by the Burlington Editors during the war. The political beliefs of Lionel Cust are not known. His being employed by the crown as Surveyor of the Royal Pictures while concurrently being a founding member of the National Art Collections Fund, born from Fabian sympathies and highly praised by the Liberal Prime Minister H. H. Asquith, suggest an adhesion to the establishment combined with mildly progressive humanitarian interests. His co-Editors Adey and Fry were altogether more radical. Adey was remembered by Siegfried Sassoon and Osbert Sitwell as a genteel and harmless person, who posed successfully as a ‘dangerous anarchist’ and ‘talked always of war and politics’. In his wartime correspondence with Herbert Horne, Adey lamented the difficulties of getting the Burlington through censorship, made several scathing comments against the war and militarism and defended the Finnish art historian Osvald Siren suspected of German propaganda. Roger Fry, pacifist by family tradition as a Quaker and formed in the progressive milieu of Cambridge University, shared similar sentiments. As early as August 1914 Fry had expressed clearly and concisely his anti-militaristic stance to Rose Vildrac, wife of the poet and art dealer Charles Vildrac: ‘What we want to do now is to denounce militarism and diplomacy, which have led us to this abyss’. Like Cust and Adey, Fry was exempt from military service because of his age. Nevertheless he had his own first-hand experience of the War when he visited his sister Margery Fry, who worked for the Quaker War Victims Relief Fund in the districts of the Marne and Meuse, in Spring 1915. Fry was openly critical of the war in his correspondence and works of art. Another Burlington writer who participated in pacifist circles with a much higher degree of militant activism was Clive Bell. Bell, who wrote three important pieces on aesthetics for the Burlington between 1913 and 1917 was, like Fry, part of the Bloomsbury Group. Bell and his wife Vanessa were also both members of the No-Conscription Fellowship (NCF), an organisation that encouraged men to refuse war service. Bell’s 1916 pamphlet Peace at Once, in which he courageously argued for a negotiated settlement with Germany, was seized by the police and was later destroyed. The Bells, Fry, Adey, like Bertrand Russell and many other intellectuals, felt that the civilised nations ought to resolve conflict in a way that would not involve mass murder and believed that ‘duty’ came not in signing up and shipping off to the battlefields, but in a philosophy of pacifism and aesthetic disinterestedness. As Michael J. K. Walsh observes, ‘Soon it became apparent, however, that in this new and highly charged atmosphere to be a conscientious objector, or even tolerant of the enemy was perhaps the most unacceptable stance of all’. In fact, what Hynes has termed ‘war against dissent’ begun as early as 8th August 1914, with the passing of the Defence of the Realm Act (DORA). DORA was designed to help prevent invasion and to keep morale at home high. It imposed censorship on journalism and letters coming home from the front line. DORA gave the state unlimited power to control the instrument of communication and the transmission of information, and to define what was meant by its terms. Stricter conditions followed in 1915 and in 1916 limitations were made even more explicit: no publication could spread reports or make statements intended to cause disaffection, or to prejudice recruiting and training. In effect, any expression of opposition to, or criticism of, the war in any art form, and any communication of such opinions to persons in other countries had become a criminal offence. Keeping this background of increased censorship in mind, it is revealing that the many articles dedicated to war matters that appeared in the Burlington between 1914 and 1919 refused to comply with the dominant discourse of apology for war and demonstrate an absence of any glorification of military endeavours. They instead concentrated on the support of charities involved in relief action. The most radical contribution was perhaps the continued reviewing of German books and German periodicals in the Burlington: in January and October 1916, in three thickly printed pages, periodicals such as the Repertorium für Kunstwissenschaft, that contained articles by principal scholars, including Max Jakob Friedländer, Wilhelm Valentiner and the young Erwin Panofsky, were scrupulously summarised. One can only imagine how precious these dense notes must have been to isolated British art historians. These reviews were only signed V. and it is perhaps not unlikely to attribute it to Valentiner himself, a fluent English speaker, a former pupil of Bode and a scholar well known to Fry. Valentiner had worked for the Metropolitan Museum of Art in New York and had written in the Burlington notes from Holland (as W. V.) in 1904-1905 and an article on Rembrandt in 1906. How such reviews that should have been censored as treasonable apology of enemy trade were ever published is simply astonishing, even more so if the author was indeed to be the ‘enemy’ Valentiner, and offers a tantalising glimpse of hidden relationships between German and British intellectuals in wartime. If the Burlington was at all able to come through censorship in the war years, it was because of the presence in its pages of more moderate writers who showed clearer sympathy for the war, such as the artist Walter Sickert and the civil servant and art historian Martin Conway. The latter was possibly the most influential support for the Burlington during the War. Conway, who in his political life alternated liberal and conservative sympathies was at the heart of the establishment, having been nominated by David Lloyd George as head of the Imperial War Museum. He had been a long time contributor of the Burlington and member of its consultative committee since its very beginnings. He continued to write for the Burlington throughout the war, with a measured but unmistakeable patriotic slant. In those difficult times, through its diplomatic connections with the conservative establishment and through publishing more moderate writers, the Burlington was successful in keeping the debate on art alive and even in maintaining some form of connections with German intellectuals through, as mentioned, the reviewing of periodicals and books. In the analysis of this magazine however, careful attention must be given to what is absent from its content as well as what is present. In times of peace and of almost unlimited freedom of speech, the point can be missed that when open dissent is not allowed, the absence of the dominant discourse – such as the lack of any ‘racial’ hatred, imperialistic apology and militaristic glorification – is a silent declaration of dissent in itself. And on these matters the Burlington was silent indeed. Those were vehemently partisan times and James Fox has recently described the mounting xenophobia that ruled the British art world: for instance, artists with suspicious names who did not change them into more British-sounding ones (such as Albert Rothenstein to Rutherston) had their works defaced or lost commissions. In fact, Jacob Epstein’s studio was raided by vigilantes and Philip de Laszlo’s engagements were cancelled by patriotic patrons. Even several sectors of the avant-garde adopted a war ethic and jingoistic language. In such an inflamed climate that politicised the social meaning of art and charged its public reputation, to cultured readers of similar sympathies, who were subject to a militaristic and propagandistic campaign from many sectors of the media, the silence of the Burlington on such matters spoke louder than any words. 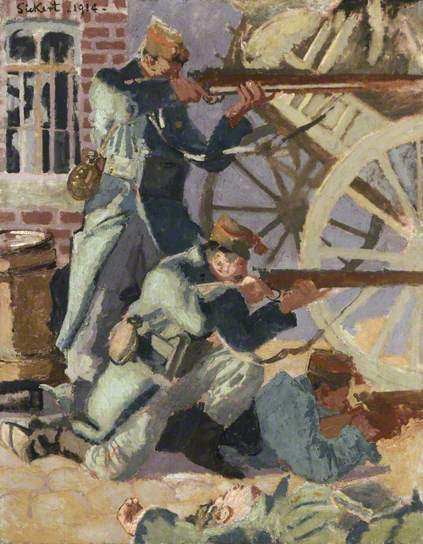 Walter Sickert, The soldiers of King Albert at the Ready by Walter Sickert, 1914. The Defence of the Realm Act was published in a supplement of the London Gazette dated 1st September 1914 (p. 6968). P. Bruneau-Rumsey, ‘Modernism, commerce and Roger Fry’s Omega Workshops’, in C. Gould and S. Mesplède, eds. : Marketing art in the British isles 1700 to the present, Farnham and Burlington 2012, pp. 227-243. 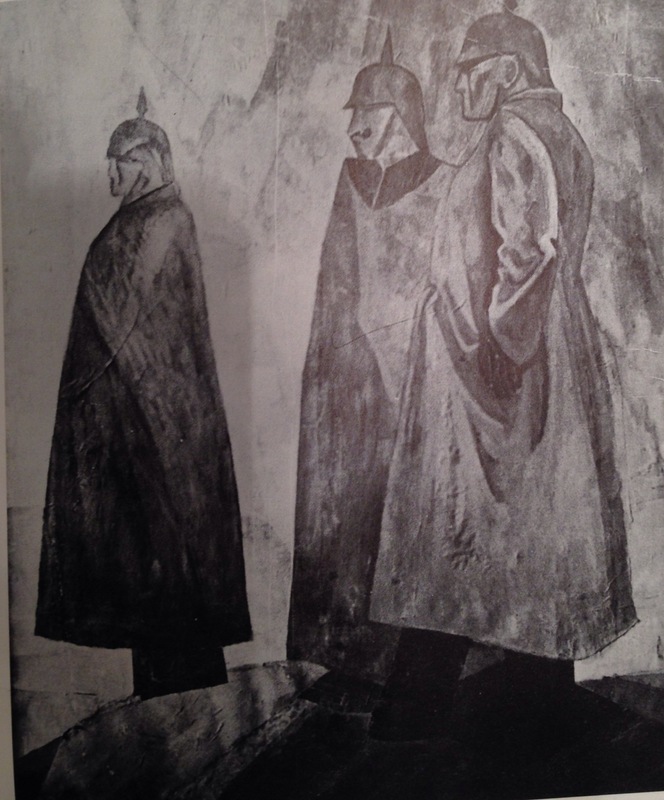 Hynes: A War Imagined; The First World War and English Culture, London 1990. J. K. Walsh, ed. :London, Modernism and 1914, Cambridge 2010. [Wilhelm Valentiner? ]: ‘Periodicals’, The Burlington Magazine 29 (October 1916), pp. 304-306.